Today is Martin Luther King Day in the United States, In that spirit, I offer you a sermon of the Baptist M.L. King as presented by Msgr. Charles Pope of the Archdiocese of Washington. 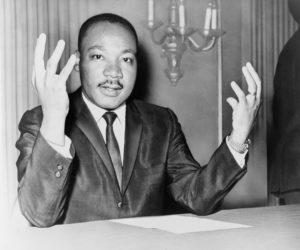 Read it all at: A Reflection on a Sermon of Dr. Martin Luther King, Jr. Refuting Atheistic Materialism. An interesting example of what we try to do here, and decidedly on point. Presented by a Lutheran, from a Catholic source, of a Baptist sermon, and all orthodox both to our churches and each others’. It’s a shame he has been hijacked by liberals: as a conservative Christian, he would object to many aspects of our modern culture. We should pray to Mary to make everything better.